Finally, it’s that post on gigantic mega-sauropods you’ve all been oh-so-patiently waiting for. Note that I’ve decided to do a new thing, and have left the ‘teaser post’ on its own (rather than over-writing it with this new version). Talking of new things, recall that something about my blogging habits is set to change soon.. the word is already on the street (to use the words of Carel Brest van Kempen), but I’m going to keep quiet about it for a bit longer. All will be revealed [UPDATE: go here for the news]. Anyway, to business. Even if you’re not an expert on dinosaurs, it’s likely that you’ve heard – firstly – that some sauropods were rily, rily big and – secondly – that these biggest of the big included such whoppers as Seismosaurus, Supersaurus and Argentinosaurus. It’s always helpful that their names are easy to remember. Recent work has not only resulted in the publication of reasonably accurate size estimates for these dinosaurs, it has also clarified their taxonomy and phylogenetic positions. Supersaurus vivianae from the Morrison Formation of Colorado is, despite its name, a valid taxon – specifically it’s a diplodocid diplodocoid, and apparently an apatosaurine (the image at the top of page shows a new skeletal mount of this taxon). Recent estimates put its total length at 33 m. The most oft-figured bit of Supersaurus is its immense scapulocoracoid: it’s usually depicted with the late Jim Jensen, its discoverer and describer, lying alongside it. For a change, here (at left) is a curious new take on the theme (borrowed from here). Oh, and if you’re wondering about Ultrasauros (originally informally named Ultrasaurus: note the spelling difference), it’s no longer regarded as a valid taxon: the type material - a dorsal vertebra - was shown by Brian Curtice and colleagues (Curtice et al. 1996) to belong to Supersaurus (come back Brian, all is forgiven!) while the famous Ultrasauros scapulocoracoid seems to belong to Brachiosaurus. Below, at left, you can see dead fish expert Graeme Elliott standing alongside the Ultrasauros scapulocoracoid (go here for hilarious caption, sorry Graeme). Moving on, Seismosaurus hallorum (originally described as S. halli), from the Morrison Formation of New Mexico, is also a diplodocid diplodocoid, but recent work indicates that it is not generically distinct from Diplodocus and should thus be renamed Diplodocus hallorum. Originally claimed to be over 40 m long, new estimates put it between 30 and 35 m. Supersaurus and Diplodocus hallorum, being relatively gracile diplodocids, probably weighed between 25 and 50 tons (Paul 1994a, b, 1997). A few more super-sauropods have been added to the list in recent years. 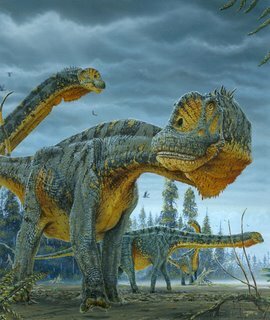 Most are titanosaurs, the predominantly Cretaceous sauropod clade originally thought to be late-surviving relatives of diplodocoids but now known to be close kin of the short-skulled camarasaurs and brachiosaurs. Argentinosaurus huinculensis, named in 1993, is a huge titanosaur from the Upper Cretaceous Río Limay Formation of Argentina: it was perhaps 30 m long. Paralititan stromeri is another massive titanosaur, this time from the Upper Cretaceous of Egypt. Estimated by its describers as having been around 30 m long, it has more recently been down-sized to a mere 26 m (image below left is Todd Marshall’s painting of Paralititan, taken from here. Go here for yours truly posing in bizarre fashion with the same image). Puertasaurus reuili, named in 2005 and from the Upper Cretaceous Pari Aike Formation of Argentina, was similar in size to these forms. Finally, Turiasaurus riodevensis is a gigantic Spanish form, and it’s not a titanosaur, belonging instead to a hitherto unrecognised clade termed Turiasauria. It was described at the end of 2006 (go here for more) and is one of the biggest sauropods known, with a length of 36-39 m.
Exactly how heavy these mega-sauropods were is mildly controversial. Accurate mass estimates generally agree that they were on the order of 80-90 tons, but Royo-Torres et al. (2006), the describers of Turiasaurus, put this animal at half this. However, they used a notoriously unreliable method of estimating weight. While you might have heard of Supersaurus, Seimosaurus or Argentinosaurus – and perhaps even Turiasaurus and Paralititan – have you heard of… Amphicoelias fragillimus? Well, ok, if you’re a dinosaur ubernerd then the answer will be yes, but not if you’re a normal person. Though described as long ago as 1878, this sauropod has remained decidedly obscure and hardly heard of until pretty recently. I’ve done my part for the cause, having mentioned it at every opportunity: in both Dinosaurs of the Isle of Wight, and Walking With Dinosaurs: The Evidence, it’s discussed and touted as, possibly, the biggest sauropod of them all. 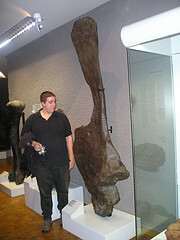 Naish & Martill (2001), for example, stated ‘What has recently been claimed as the biggest of all sauropods and, indeed, the biggest of all land animals, is actually a specimen discovered in 1878. Based only on a single enormous vertebra, now lost, Amphicoelias fragillimus has been estimated to have reached a length of 60 m and may have attained a weight of 150 tons!’ (p. 230). If these estimates are valid, then this animal was twice as long as Supersaurus and Diplodocus, and perhaps over four times heavier. Err, gosh. In August 1878 the famous and prolific scientist* Edward Drinker Cope (1840-1897), portrait at left, described a new immense sauropod, Amphicoelias fragillimus, from the Garden Park quarries of the Morrison Formation of Colorado. It was represented only by an incomplete dorsal vertebra and the distal end of a femur (contra Naish & Martill above: whoops!). A good drawing of the vertebra was provided (Cope 1878), showing that this sauropod was clearly a diplodocoid: a member of the same sauropod clade as Diplodocus, Apatosaurus and their relatives (the name Diplodocimorpha is also sometimes used for these animals: see Taylor & Naish 2005: free pdf available here). The big deal is how, err, big these remains were. The partial vertebra had a preserved height of 1.5 m and, when reconstructed on the basis of comparison with complete diplodocoid vertebrae, has a total height of 2.7 m. Again… gosh (or words to that effect). * Though usually described (by palaeontologists) as a palaeontologist, Cope was also an accomplished herpetologist and ichthyologist, which explains the name of the journal Copeia. If history were fair, we would all have grown up familiar with Cope’s hyper-enormous Amphicoelias fragillimus, and we would be less impressed by Brachiosaurus and Balaenoptera, let alone with paltry little 20-m long sauropods like ‘Angloposeidon’ (go here). But it was not to be, and it was to sink into the morass of obscurity. In a major 1921 review of Cope’s sauropods, Henry Fairfield Osborn and Charles Mook noted that they were unable to locate the immense vertebra in Cope’s sauropod collection (Osborn & Mook 1921), today at the American Museum of Natural History (New York). It was lost. Cope, E. D. 1878. A new species of Amphicoelias. American Naturalist 12, 563-565. Curtice, B. D., Stadtman, K. L. & Curtice, L. J. 1996. A reassessment of Ultrasauros macintoshi (Jensen, 1985). In Morales, M. (ed) The Continental Jurassic. Museum of Northern Arizona Bulletin 60, 87-95. Davidson, J. P. 2002. 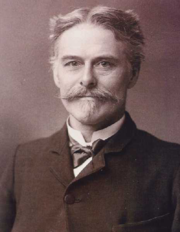 Bonehead mistakes: the backround in scientific literature and illustrations for Edward Drinker Cope's first restoration of Elasmosaurus platyurus. Proceedings of the Academy of Natural Sciences of Philadelphia 152, 215-240. McIntosh, J. S. 1998. 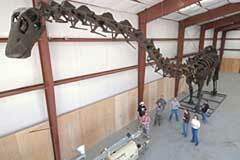 New information about the Cope collection of sauropods from Garden Park, Colorado. Modern Geology 23, 481-506. Osborn, H. F. & Mook, C. C. 1921. Camarasaurus, Amphicoelias and other sauropods of Cope. Memoirs of the American Museum of Natural History, n.s. 3, 247-287. Paul, G. S. 1994a. Is Garden Park home to the world’s largest known land animal? Tracks in Time 4 (5), 1. - . 1994b. Big sauropods – really, really big sauropods. The Dinosaur Report Fall 1994, 12-13. - . 1997. Dinosaur models: the good, the bad, and using them to estimate the mass of dinosaurs. In Wolberg, D. L., Stump, E. & Rosenberg, G. D. (eds) Dinofest International: Proceedings of a Symposium Sponsored by Arizona State University. Academy of Natural Sciences (Philadelphia), pp. 129-154. Royo-Torres, R., Cobos, A. & Alcalá, L. 2006. A giant European dinosaur and a new sauropod clade. Science 314, 1925-1927. If anyone wants to know, I'm 6 feet 2 inches (1m 85) in height, give or take. I once heard something (I think on the DML) about the giant titanosaurs (Argentinosaurus, Argyrosaurus, Paralititan, etc.) all being below 28 m. or so in length. I believe the estimates were based on Rapetosaurus. Can the length estimates (big or small) for these titanosaurs really be estimated well with such meager material? You forgot to mention Sauroposeidon. =P And wasn't some of the Ultrasauros material referred to Brachiosaurus as well? Still, excellent summary of the giants of giants. It's amazing how supergiants seem to have evolved in so many lineages. They shrunk seismosaurus?! Say it ain't so! Next time I have my family in Albuquerque, we'll have to go over to the Natural History Museum to show them the seismosaurus humerus (?) on display there. It's been ges for me and it was a very proud display that they had. It'd probably blow my wife's mind. 2. Anonymous: no, lengths cannot be estimated well with such meagre material. We just do the best we can. A huge amount of (hopefully educated) guesswork is involved. For example, when Matt Wedel estimated the length of Sauroposeidon based only on an articulated sequence of four cervicals (free PDFs here and here, the obvious thing to do would just have been to compare the length of the S. cervicals with the corresponding elements of the closely related Brachiosaurus brancai, and scale up the total length of B. brancai accordingly. Instead, Matt observed that the S. cervicals are proportionally narrower than those of B., and so inferred that its neck may have been disproportionally long compared with its trunk and tail, just as the neck of Diplodocus is disproportionately long compared with that of Apatosaurus. (See Wedel et al. 2000b: 375-376.) Bear in mind, too, that published mass estimates for a SINGLE SPECIMEN of B. brancai have varied between 14900 and 78000 kg, a factor of more than five. As you can see, with so many levels of inference, all bets are extremely tentative. 3. Will: a Seismosaurus humerus? That's news to me. The last I knew, there were no known Seismosaurus limb bones - just vertebrae and parts of the pelvis. Has more been excavated? Finally, it behoves us all to remember that, while other sauropods may have been larger, brachiosaurs were just plain cooler. reliable, but I like it anyway, because (as detailed in the supp. inf. of the Turiasaurus paper) for giant sauropods it gives estimates as low as when conventional methods are combined with very low assumed densities (to account for all the air sacs) -- 29 t for Brachiosaurus brancai. Next time you're in Albuquerque, you might be pleasantly surprised. The NMMNH revamped its Jurassic hall about two years back--instead of the few scraps that were out before (mostly tail vertebrae) we put in a full-sized Seismosaurus skeleton (cast/reconstructed) and as much of the original material as the second floor would support. Even scaled back to 30-odd meters, its an impressive beast. Nice writeup, Darren! Looking forward to the second half. A very cool post, not least for introducing me to banoffee pie. I will have to include a mega-sauropod figurine when I try it out. I think he's probably referring to the sculpted replica of the "Ultrasauros" forelimb on display at the NMMNH&S. Helllooo? Did no one notice the pin-up girl? Darren, I believe I've got a solution to your cash flow problem: I'm thinking "Calendar Girls of Paleontology." What self-respecting University research scientist would not want to nail this to the wall of his basement cubicle? Post a note on the campus bulletin board: "Attractive young women needed for dinosaur project: Basement, Natural Sciences Building. Casual dress." Is this crude? I apologize. Hate to do this to you, buddy, but the scap that Graeme Elliott is standing next to is not Supersaurus, although it is probably labeled as such. That's the big "Ultrasauros"/Brachiosaurus scap, also from Dry Mesa. If you don't believe me, dig out Jensen's and Curtice's papers and have a look. In particular, pay attention to the way that the distal third or so is expanded into a rectangle rather than a fan shape. If you don't have them to hand, look at my Brachiosaurus reconstruction in the original Sauroposeidon paper--I used Brian's illo of the "Ultrasauros" scap as the basis for my Brachiosaurus the first time around (but not the second--the scap in the redrawn illo from Wedel & Cifelli 2005 is based on the B. brancai scap). Interestingly, I don't know that anyone has pointed out how dissimilar the "Ultrasauros" and B. brancai scaps are in outline. Also, the object that the hottie is composited next to almost certainly is the Supersaurus scap from Dry Mesa--again, have a look at Jensen's outline drawings. I'm just picking nits here. Good posts. Keep 'em coming. Dammit dammit dammit. This is why you shouldn't state things without checking the literature first. Because the identity of the scapulocoracoid in the image with Graeme is relevant to the adjacent text, I'll change it. Thanks for pointing this out. Sigh.. I'd have thought by now that I'd immediately be able to recognise the difference between a diplodocoid scapula and a macronarian one. Ordinarily I am, honest. The fact that you hold forth authoritatively on green lizards, Bornean flying squirrels, Asiatic seals, maniraptoran pruning, domestic dogs, cave salamanders, gull phylogeography, giant tortoises, terror birds, rorqual feeding, azhdarchid ecology, and a hundred other topics, and still manage to beat yourself up for not catching a misidentified isolated sauropod scap, is one of the things I like best about you. If you ever find anyone who holds you to a higher standard than you hold yourself, do not be troubled. For you are in Elysium, and you are already dead! because curtice said that? ?, many paleontologist have examinated the dorsal vertebrae for years and all of them said that it was very closed to the brachiosaurus brancai of naturkunde museum. is any paleontologist to day that defend that ultrasaurs is real, that the vertebrae is of a brachiosaurid? HI Just found your blog because my 12 year said she heard that dogs maybe don't come from wolves - I've seen the pariah dogs in Palestian ( they look more like foxes i think) Anyway thanks for all the work you obviously put in on your site/blog.